Now that's a nice tattoo! When last this Baby Boomer looked at tattoos over two years ago, I rendered forth a rather curmudgeonly view. I looked, I winced, and I looked away. But I also wrote that each generation establishes its own cool, and if we learned anything from the 60's, it's that we ought to respect each other's differences. So, Gen X, Gen Y, and millennials everywhere, today I respect you and embrace you and your tattoos! Most Boomers take no shine to tattoos, and there is a special reason for this that most non-Boomers cannot appreciate. In the late 60's and early 70's, the world was generally divided into freaks (i.e hippies and pseudo-hippies) and greasers (motorcycle heads, uneducated bigots, and singer Wayne Newton). There were also "preps," but they're irrelevant to this discussion; for more on the subject see the movie "Caddy Shack" and/or the latest L.L. Bean catalog. Freaks protested the Vietnam War, read pretentious books like Steppenwolf, and smoked the very best dope their parents' monthly expense checks could afford. Greasers protested protesting the Vietnam War, got no expense check and didn't know the meaning of "pretentious," and were frequently found engaging in a favored past time of yelling at freaks "why don't you get a haircut, you (expletive for a gay person)?!" The greasers were also the ones with all the tattoos, often in the form of a skull and crossbones, a crudely rendered Jesus, and/or lots and lots of hearts and arrows with chicks' names etched through the center of them. These were our youthful Baby Boomer times and our heroes reflected those times. How many tattoos do you think the Beatles, Mick Jagger, the Who, Jimi Hendrix, Jim Morrison, Bob Dylan, and Jerry Garcia had collectively? Well, math isn't exactly my strong suit but .... let's see, carry the one, add the two, multiply by 15 .... ah yes, the answer is zero! And all of those seminal rock stars who survive to this day continue to be ink free. 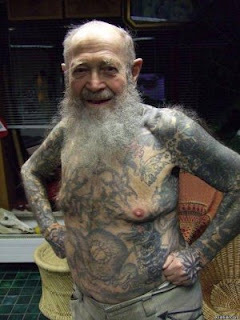 That is why to many Boomers the concept that tattoos are now considered hip seems to make about as much sense as if big fat pimply guys who never shower and pick their noses in public were to suddenly be considered hip! But I have looked at tattoos once again and I have evolved. 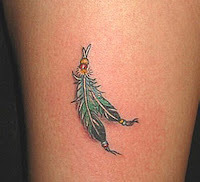 And the fact is I now find some tattoos kind of pretty. As a Boomer, I would never get one myself, but one or two or even three strategically placed tattoos on a younger person are quite okay in my newly revised and updated book. Don't expect me to ever share the best dope my parent's expense check will afford with you! I'm with you on this subject, Perry. A small, discreet tattoo on a girl's cleavage is cute, but covering every square inch of real estate is like wiping out a national forest to put up a parking lot. Thanks, Russell. I agree that this is somewhat controversial because younger people always consider Boomers narrow minded about tattoos. They do not understand that with some exceptions, of course --- Janis Joplin had tattoos as did some returning war veterans & even a few hippies --- most (not all) people with tattoos were considered the antithesis of the counter-culture, narrow-minded, bigoted, and ignorant, everything we were against. And everybody's experiences when young impact us for the rest of our lives. "AHHHHH!!! Watch out, Adam, there's a goddamn snake crawling on you!!" Russell, once again you show the wisdom and prudence you are so well known for. And I like it that somebody agrees with me! I have 5 tattoos. Got my first one in 1993, when I was 43, and my last in 2006, when I was 56. But yeah, I agree with you about the tattoos in the 60s and 70s being more of a biker look — though there's nothing wrong with that. 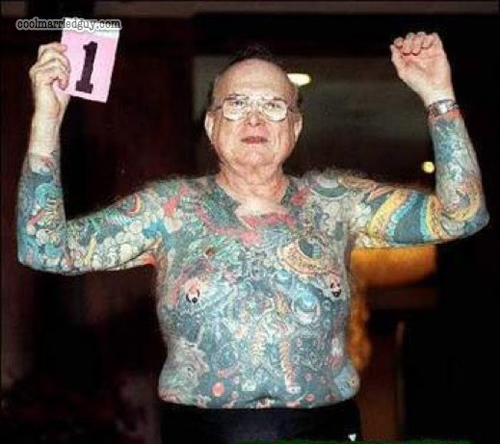 But later on, in the 90s and beyond, tattoos became Body Art — LOVE 'em!!! For me, it's the other way around. Tattoos are far more acceptable on men than on women. To be fair, it rarely looks good on either gender, especially after aging. If I was to get a tattoo, it certainly wouldn't be something like a flower, or a star. It would be something more meaningful than that. It would have to be very meaningful indeed if I was going to have it on my skin for the rest of my life. I just don't see the point of going through all that effort and expense to have a FLOWER put on your skin? Why would you bother? Quite frankly, I don't know why either. 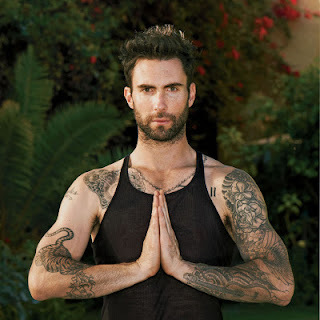 My preference is always for no tattoos. However, I am merely saying that I can now see the attractiveness of certain tattoos and understand why a discrete couple of tattoos tastefully handled may appeal to some people who wish to get them for whatever their personal reasons. But I don't mean to be all serious here; my main goal was to express in hopefully humorous fashion why rebellious Baby Boomers who pioneered beards, long hair, ripped jeans, drugs, political activism and lots more today don't dig tattoos. And ... ahem ... to show how open-minded I've become! Now that's a valid point. The Rolling Stones didn't have tattoos and either did Jimmy H? That means they are not cool and will never be cool (although I did give my daughter permission to get a tattoo by her bellybutton that said "Do Not Peirce!" Oh those elderly illustrated men are a good reminder! Oh no, Linda, you don't find those old guys appealing?! After I just had my full body inked with the likeness of Tom Bergeron?! !